I won’t be going to Coachella (in LA in April) this year either. As if I have ever had the money or time. But it always hurts to read the line-up. There is just too much amazing music in one place. Black Keys, Arcade Fire, Brandon Flowers, Kings of Leon, Lauryn Hill, Empire of the Sun, Erykah Badu, Kanye West, Nas & Damian Marley, Broken Social Scene, Angus & Julia Stone and some of the best House DJ’s. Oh well. Maybe next year right? 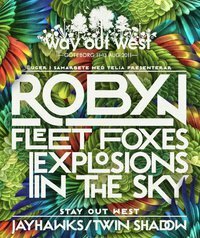 At least Way Out West (happening in Gothenburg in August) have pre-announced one of my favourite 90’s bands: Jayhawks! Foo Fighters playing in Stockholm in June!! Supported by the always so awesome Band of Horses and promising Biffy Clyro.